Colin has been supporting Mary Potter Hospice as a meal service volunteer for more than 10 years now. He takes care in preparing the meal he delivers to the patients, as he’s aware that for some, this could be the last meal they have – but he feels that everyone deserves the care and respect which Hospice provides. I like to take care in what I take in for the meal – presenting the food nicely with a nice little vase of flowers from the volunteer florists on their tray. I like to think I’m helping give the patients a nice point to the day – a cup of tea, a nice meal they liked, a smile or a story – the thanks from them makes it worthwhile. We’ve also been fortunate to utilise Colin’s skills as a carpenter and joiner, helping to make the small wooden houses for the Tough Stuff children’s art projects. He really enjoyed seeing some of the recent pieces used in our display from Island Bay School. Colin came to support Mary Potter Hospice from his role as an almoner for his masonic lodge. 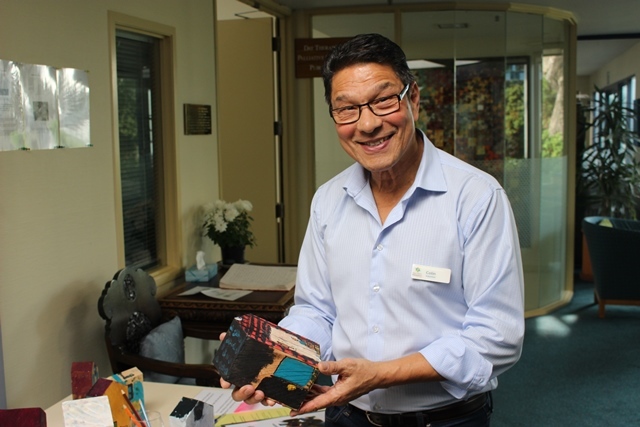 It was his responsibility to look out for the elderly in their community, and he found the connection through the people he helped to care for, who were also receiving care and support from Mary Potter Hospice. Colin moved from the UK to New Zealand with his family in 1972. When his father passed away in the UK he found it difficult being far away, but also appreciated the support of local church groups who stepped in to help support his father. Colin thought it was amazing that people would step up and help like that, and that support encouraged him to volunteer. I enjoy coming back, and I enjoy and admire the people who work here. [The hospice staff] come back, day after day, and sometimes the job is really hard, but they always have a smile on their faces. Everyone is so friendly, and so appreciative. Everyone thanks you, which is just lovely. Thank you for your ongoing support, Colin – we’re so grateful to have you with us.